Acer Company recently launched its new Android based Smartphone, the Acer Liquid Mini at CES - 2011 in Las Vegas and is coming soon to India. 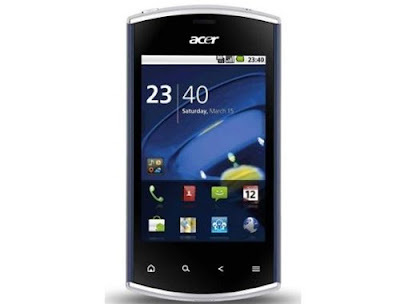 Acer phone is affordable Smartphone with all smart features that suits all the needs of the users. The Acer Liquid Mini, without Android, can be currently found in the Indian market at an affordable price of 15,000 INR. The upgraded Smartphone will be available in five vibrant colors – Piano black, light pink, royal blue, lime green and jet silver. 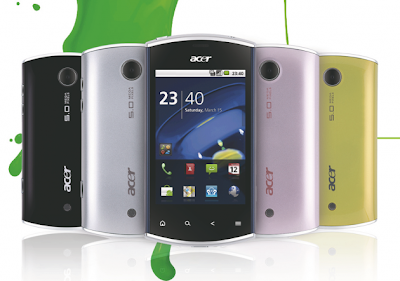 The Acer Liquid Mini runs on the powerful Google Android 2.2 Froyo operating system powered by Qualcomm - 7227 processor of 600MHz. The Google Android allows accessing more than 2 lakhs applications from the big Android market. It is a bar phone, full touch screen with TFT display type of 3.2 inches with 256 k colors. One of the best features is that it is DLNA certified phone, which means that you can enjoy content by accessing your computer on your Smartphone. The phone works at different frequencies of 850/1900 GSM and 900 /2100 MHz in HSDPA. The phone has 5 mega pixels of HD camera with digital zoom including features such as auto focus and geo tagging that captures HD utmost quality pictures. It is a lightweight phone of about 109 Gms only. The 3G Smartphone capability of Acer Liquid Mini makes you surf internet at ultra high speed, download apps, watch videos, and play games anytime and anywhere! Further, the Smartphone is equipped with a fine HTML browser that allows you to surf the possibilities of World Wide Web with GPRS connectivity. The Acer Liquid Mini is a wireless enabled phone that lets you to connect with the Wi-Fi supported areas. The phone can support the messaging features like SMS, MMS and supports e-mail with exchange, Exchange, POP3 and Google Mail. Acer Liquid Mini has inbuilt media player that allows you to play almost all audio and video formats that make it an entertaining gadget. The Acer Liquid Mini has 3.5 mm head phone audio Jack. The Smartphone lets you store large volume of data with a support of internal memory, which can expand up to 32GB with a Micro SD card slot. By using the Image/photo call feature in the Smartphone, the users are able to identify the callers by viewing their pictures. GPS support, OTA synchronization, HD video recording (480p), 3G HSDPA support are some special features included with the Acer Liquid Mini.